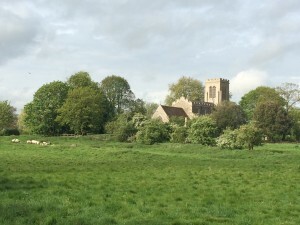 The wild garlic and sting nettles have started to appear meaning it’s time to get foraging! And killing unwanted nettles in your veg patch or garden in the process. 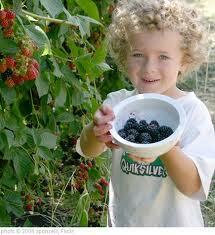 Our Green and pleasant land has a bounty of wild foods most of the year. Hunting for them will not only get you out and exercising, but spice up some old dishes with delicacies you have picked yourself. Now, every chef worth their salt boasts of foraged fare on menus, from seashore finds such as samphire and sea buckthorn, to woodland wonders such as mushrooms, wild garlic, elderflowers and sloes. The wild foods growing in the woods, hedgerows, shorelines and forests all around us, whether flower or fauna, can bring a whole new dimension to cooking, and more and more people are keen to have a go. Of course, as with all things there are safety precautions to consider – such as only picking things you know are edible and not stripping the land bare of its bounty. But even for the foraging novice, the likes of sweet chestnuts, wild blackberries, wild plums, nettles and rosehips are good starting points to build on. But beware, once your start, you won’t be able to stop, and every woodland walk will turn into a foraging adventure, complete with plastic gloves and tupperware box! If you’re keen to embark on a foraging excursion then why not sign up to a course? Visit the BigBarn MarketPlace here to find cookery schools offering foraging-themed classes. Or if you fancy trying foraged fare, but don’t want the hassle, search for retailers and producers specialising in foraging goodies – they do all the hard work for you! If you have already tried your hand at foraging and have a recipe to share, or any other recipe, and would like the chance to win a prize, please video your recipe and add it to KIS (Keep it Simple) Cookery. Please have a look at existing videos here and try and keep your video less than 2 minutes long. 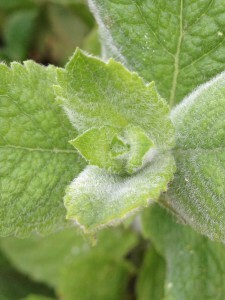 At this time of year stinging nettles are growing in abundance. People think of them as nasty weeds yet they can be harvested and made into delicious soup! They taste similar to spinach. Nettles are packed full of vitamins and minerals and include vitamin K as well as vitamins A, C, D and E. They have anti-inflammatory properties and are effective in the treatment of hay fever and asthma, so I believe. The other brilliant thing about nettles is that they’re free! Do have a go at making this, I make it every spring and it tastes absolutely delicious. When harvesting nettles, just snip off the tops of the plants so that you have the tips and a few new leaves. Please make sure you wear gardening or thick rubber gloves! Mint. A joy to see it spread like nettles? Shake each nettle top when picking to get rid of the bugs! 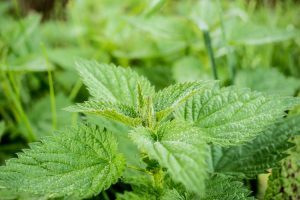 Wash the nettles in plenty of cold water then change the water and wash again until there are no traces of soil or little insects. Place in a colander to drain. Peel and slice the onion. Mince the garlic clove. Peel and chop the potato into ½”/1.25cm pieces. Melt the butter in a large saucepan. Add the onions and cook gently, stirring occasionally for about 5 minutes until softened. Add the garlic and potatoes and cook for another minute. Add the stock and wait for everything to come to a simmer, then add the nettles. Push them down well with a wooden spoon and stir. Simmer, covered for about 20 minutes, stirring every now and then, until the potatoes are soft. Take the pan off the heat and either mash with a potato masher, whizz with a hand blender or liquidize until smooth. 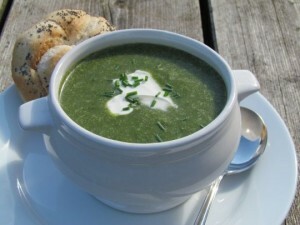 Pour into soup bowls, add a dollop of sour cream and sprinkle with chives. Delicious!